Since flax is extra high in omega-3 fatty acids, it's known as beneficial to lowering LDL cholesterol levels, may boost immunity and as a dietary supplement can reduce dry skin and eczema breakouts. Most healthy oils, including the essential fatty oils found in flax, have a short shelf life. When flax goes bad, it's called "rancid." Rancid flax is not appetizing, and you should easily know when it goes rancid, but a few indicators can help you determine if the flax is past the point of being edible. Pay attention to the "best by date" often marked on the flax container. Whole flax lasts up to seven years, ground flax lasts up to two years and flax oil lasts about one month. Smell the flax. It should have a mild smell. If flax smells like fish or has an otherwise strong odor, it is rancid. Taste a small amount of the flax. It should have a mild, nutty flavor. If the flax tastes bitter, sour or otherwise unappealing, it is rancid. Purchase whole, not split, flax seeds. The splitting exposes the inner part of the seed to light and heat, which decreases the nutrients contained in the seed. Purchase flax oil only in black containers. Store flax in the refrigerator in a sealed, airtight container. 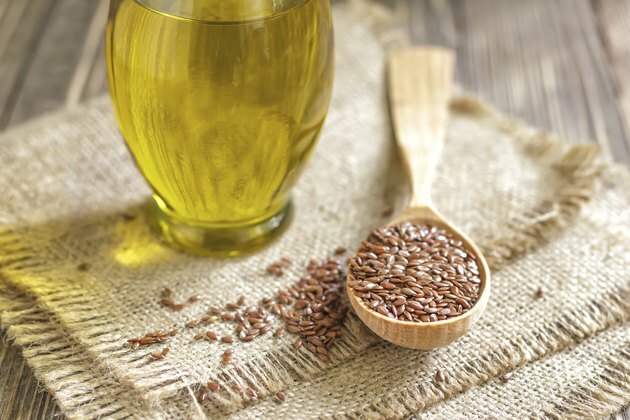 Purchase small amounts of flaxseed oil; most oil goes bad within six weeks after it is pressed.